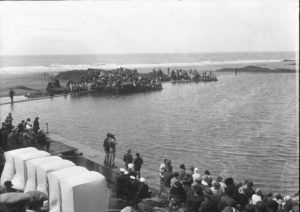 Bude Sea Pool was built in the 1930s to provide a safe environment for swimming for the people of Bude. 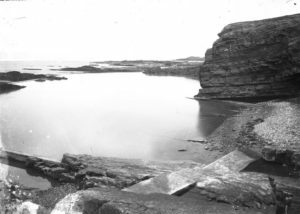 This semi-natural pool, measuring 91m long by 45m wide, was created under the curve of the cliffs in a conservation area. 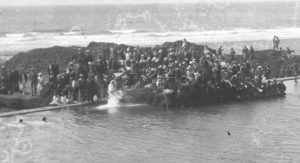 It provides the unique experience of being in or on the sea, close to the ferocity of the Atlantic Ocean, but sheltered from its extreme effects. The photos were taken by Jake Harrison and Nellie Thorn (Harrison), the last of the Thorn Photographers. Their glass negatives are in the Thorn collection. Jake Harrison married Nellie. Her mother was Sarah and her brothers Samuel and Harry Thorn. They were the five who documented Bude. 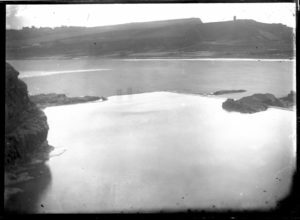 Harry Thorn started his business in the early days of photography; his are the earliest photos of Bude, in the mid 1850s. In 1851 Frederick Scott Archer, developed William Fox Talbot’s process so that anyone could take photographs. The hazards of the chemicals used were not understood and Harry died in 1876 and the age of 37, leaving his brother and sister to carry on with his pioneering work. 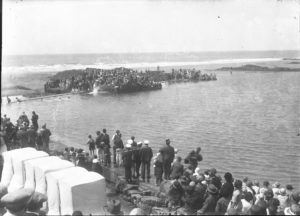 Lifeboat Day before the pool was built. 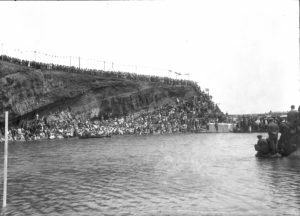 A big occasion for the town in those days as it is today.The rocks which form part of the pool and the cliff behind, are clear. The pool is just finished and the narrow width of the walls is evident. The ghostly images are of two people walking along the wall. There is no sluice gate at this stage. In the foreground where the bathing/changing tents are is the position of the children’s paddling pool. 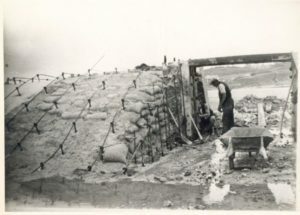 This was filled in sometime later after the walls of the pool were made larger. There is a group of girl divers waiting by the diving rocks on which is a spring board. 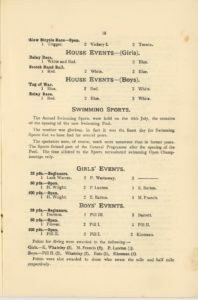 The County School swimming sports were held on the opening day and Kay Whateley (Thorn) was awarded 2 points as was Mary Francis, some may remember them. The results were printed in the school magazine later that year. Poor quality and taken from a much larger negative. 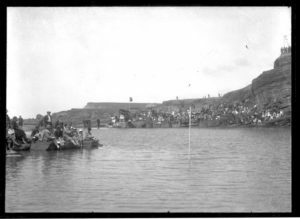 Spectators on the middle, diving rock, include Stanley Oke. Standing behind the group with open neck shirt and dark jacket. He was an accomplished pianist and organist who turned down a musical career in London to teach in Bude at the County School, later Bude Grammar School and St Petroc’s School, as well as private tuition. He was the organist at St Michael’s Church and choirmaster. 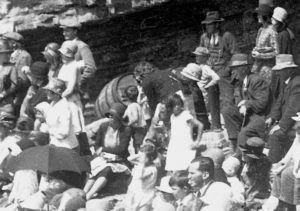 Sitting in Plus Fours is John Martin Thorn, brother of Spencer Thorn, one of his daughters, Maureen is sitting on the end of the rock. The small boy between them is Ronald Thorn, son of Spencer Thorn. 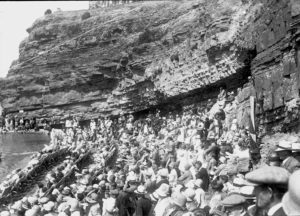 Crowds line the pool and the cliff above. 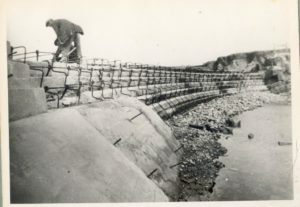 There was a “path” down the cliff to the beach before the pool was built. It was steps half way down to the sloping rocks. It was where the current steps are now. In this photo, full of people! All public funding for Bude Sea Pool was withdrawn in 2010. The Friends of Bude Sea Pool fought a vigorous campaign in 2011 to keep the pool open for the season, and took on its management in 2012. We have since made much-needed repairs and continue to invest in new facilities to secure Bude Sea Pool for future generations and to keep it FREE. 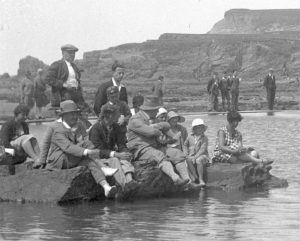 Bude Sea Pool is a focal point for the coastline in Bude and has always been used for much more than swimming. If you go down to the Pool today, chances are you’ll see endurance trainers, triathletes, kayakers, surf training and lifesaving, beach hut enthusiasts and sunbathers all making the most of this unique amenity. Why not check out what our visitors say about us on TripAdvisor? There really is something for everyone at Bude Sea Pool, and the Friends of Bude Sea Pool are constantly improving the facilities on offer and the safety of everyone who visits. We have to raise in excess of £40,000 every year just to keep Bude Sea Pool open and FREE of charge for everyone, so we rely on the generosity of our supporters and sponsors, not just in Bude but all over the world. There are lots of ways you can support Bude Sea Pool. Check out how you can get involved, or see how to become a Business Sponsor.